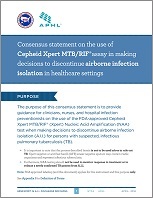 A national workgroup has issued recommendations on how to use GeneXpert in decision-making on airborne infection isolation in healthcare settings. The recommendations are provided in the consensus statement. The workgroup also developed two algorithms on the decision-making process for use as standalone tools, one in PDF format and another in Microsoft Word format that can be branded for use in your agency or facility. To customize the Word document, edit the header by going to the Insert ribbon and choosing Header. In the submenu, select Edit Header. In the header, click on the anchor icon and press the Delete key to remove the placeholder logo graphic. You can type in the name of your agency or facility and/or add its logo. To add its logo, click the Insert button on the ribbon and navigate to your logo or type in the name of your agency or facility. When you’re done, click the Close Header and Footer button and save the document.